Contains two complete games: Friedland 1807 (designer Joseph Miranda) and Vittoria 1813 (Vance Von Borries). Vittoria is a two-player, brigade-level simulation of the great battle fought on 21 June 1813 in northern Spain. The dramatic defeat of the French army by Allied forces under Lord Wellington ended Napoleonic dreams of conquest in Spain. 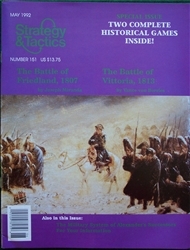 Friedland uses the Napoleonic Battles system. One player is Napoleon commanding the French army; the other player is Bennigsen, commanding the Russians.